After taking a break and sucking down some beer, you're ready for the real fun! 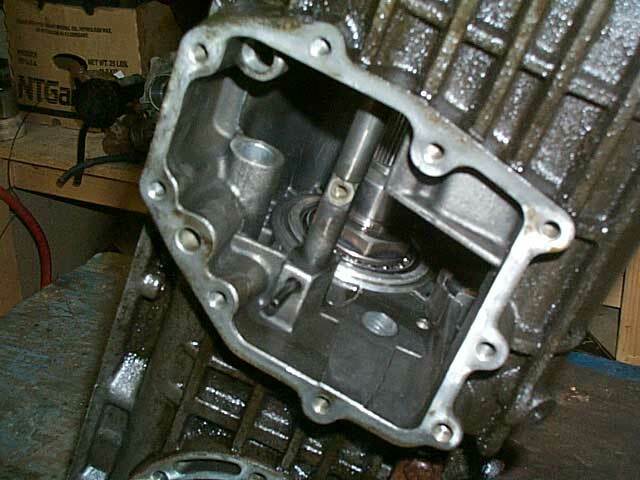 You have to remove the transfer case in order to get to the main housing. 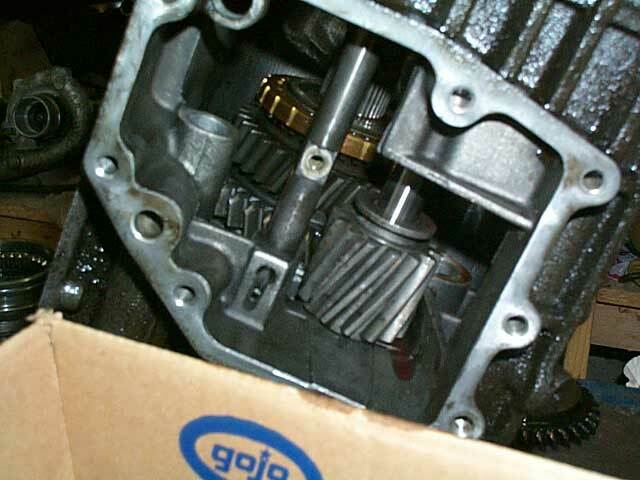 In order to remove the transfer case there are a couple things you need to do! First you must remove the 2 chain gears that drive the transmission. These will need a big air gun to remove! The best way to do this is to lock up the gears by engaging 5th gear and reverse at the same time. To engage 5th just move the shift rod into 5th gear. To engage reverse you must take off the reverse linkage and move the reverse gear back engaging the gear. After doing this you can remove the huge nuts and chain gears rather easily. I believe one of the chain gears has a circlip on it. 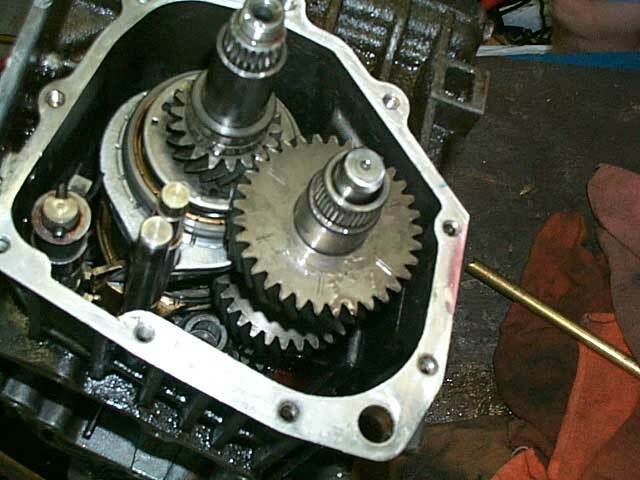 Once you remove the big gears, you have to remove the primary drive. This is held into the transfer case with 6 bolts. 5th gear is next. Before you can remove 5th gear you must remove the rod holder and pull/push the cluster gear rod and pull it out enough to clear 5th gear. DO NOT PULL THE ROD ALL THE WAY OUT! Everything inside will come crashing down if you do! Here you can see the rod on the lower right removed about halfway. The top rod is the reverse gear rod. It's almost time for that second beer! 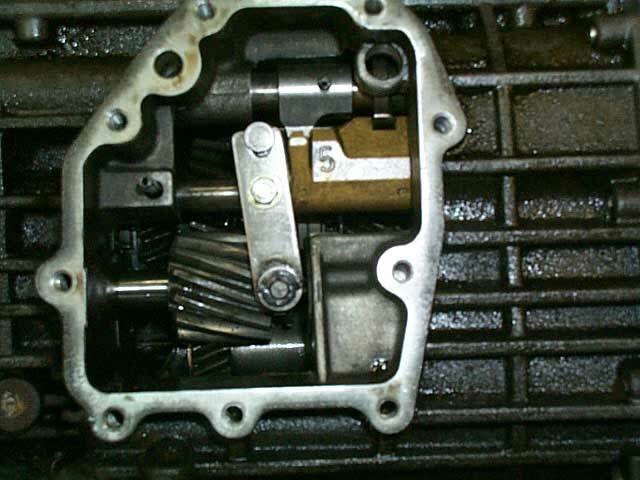 After the cluster gear rod is out of the way, you can get 5th gear out. 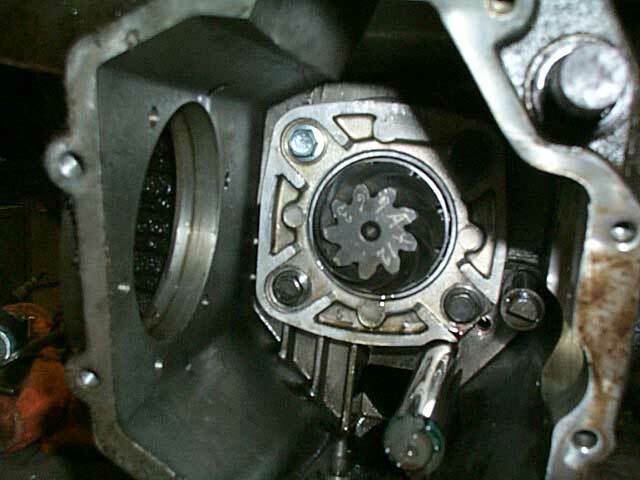 First, you have to slide the spacer off of the pinion shaft and then 5th gear will practically fall out! Now we are ready to remove the transfer case. 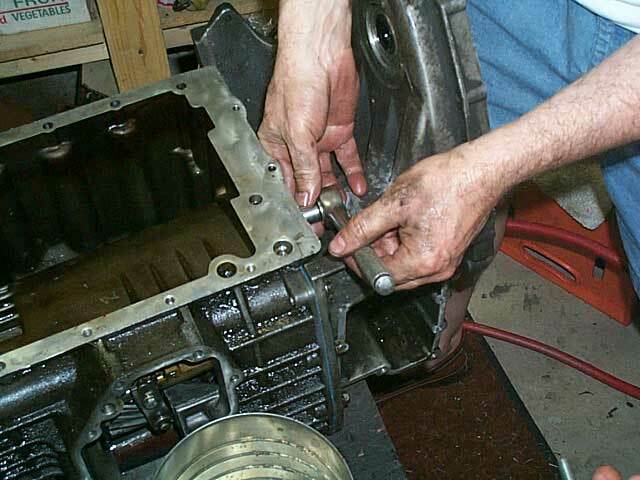 Remove the bolts to the transfer case. Be sure to get the one that is on the opposite side than all the others! Next hammer out the circle spacers that hold the transfer case straight onto the housing. This is what you should be looking at. Here you can see the big circle where the spacer goes. It's time for that second beer!